As previously discussed here & here, I am studying two Twitter discussion events as sites of professional identity formation and development. 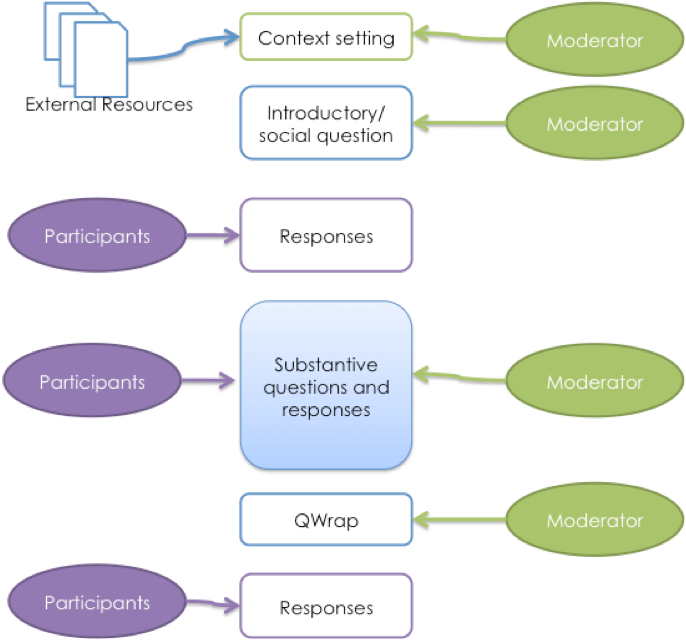 The broad structure of the two events is broadly similar to the research process of a Tweetstorm: “an online, open brainstorm-like session via Twitter” (Sie, Bitter-Rijpkema, and Sloep 2009: 60). A Tweetstorm was described as a six stage process involving: (i) the context established by, for example, a topic briefing; (ii) questions are presented on Twitter by the event moderator organised using the specified event hashtag; (iii) answers to the questions are given as tweets by participants; (iv) these tweets are aggregated, for example, using Tweet Archivist; (v) the aggregated tweets are analysed into categories and (vi) the categories are then analysed. The outputs from a Tweetstorm are a series of core statements drawn from the knowledge of the participating experts. As such, a Tweetstorm has similarities to the processes of Delphi studies (Nworie 2011) or collaborative concept mapping (Simone, Schmid, and McEwen 2001). The individual discussion events broadly followed the structure of a Tweetstorm. However, in these discussion events, the Tweets are not aggregated, categorised or systematically analysed. Rather, they conclude with a call for participants to identify the key points of the discussions and any actions they may take in response to the points made. Nworie, John. 2011. “Using the Delphi Technique in Educational Technology Research.” TechTrends 55 (5) (August 11): 24–30. doi:10.1007/s11528-011-0524-6. Sie, Rory, Nino Pataraia, Eleni Boursinou, Kamakshi Rajagopal, Isobel Falconer, Marlies Bitter-rijpkema, Allison Littlejohn, and B Peter. 2013. “Goals , Motivation for , and Outcomes of Personal Learning through Networks : Results of a Tweetstorm.” Educational Technology & Society 16 (3): 59–75. Simone, Christina De, Richard F. Schmid, and Laura A. McEwen. 2001. “Supporting the Learning Process with Collaborative Concept Mapping Using Computer-Based Communication Tools and Processes.” Educational Research and Evaluation 7 (2-3) (September 1): 263–283. doi:10.1076/edre.7.2.263.3870.